Florence holds host to many Italian traditions. Many fly under the radar and from my limited experience, they can be hard to find. I stumbled upon a tradition I had never seen or heard of before: a cappuccino or coffee accompanied by a shot glass of water. I had spent only two days in the city and had stumbled upon a small coffee shop on the corner of Via de' Pucci and Via Ricasoli. The coffee shop, Caffé Ricasoli, was bustling with Italians ordering Paninis, cappuccinos and other kinds of traditional food. There was a counter with a cash register, stocked with gum, mints and small packaged snacks, placed in front of a wall of multicolored cigarette packages. Outdoor style furniture was placed randomly about for dining in. Finally, the beacon of hope in my sleepy, jet lagged eyes, the bar (known to us newbies as the coffee bar). Two young women were standing in front greeting and ushering people to various tables. I was ushered to a nearby table and found comfort in sitting down to be able to check out the many items on the menu. My advice: try to avoid sitting at a table because most Italians have their cappuccino or espresso at the bar (prices are more expensive for your coffee if you sit down at a table). After looking at the menu I turned my head to face the bar. The baristas behind the counter were rushing to get cappuccinos out, as the number of Italians itching for coffee increased steadily. There was a sudden rush within the Caffé and suddenly I noticed a peculiar tradition I hadn't noticed anywhere else. Each Italian had come in to have their morning coffee and were served a side of a shot glass filled with clear liquid. 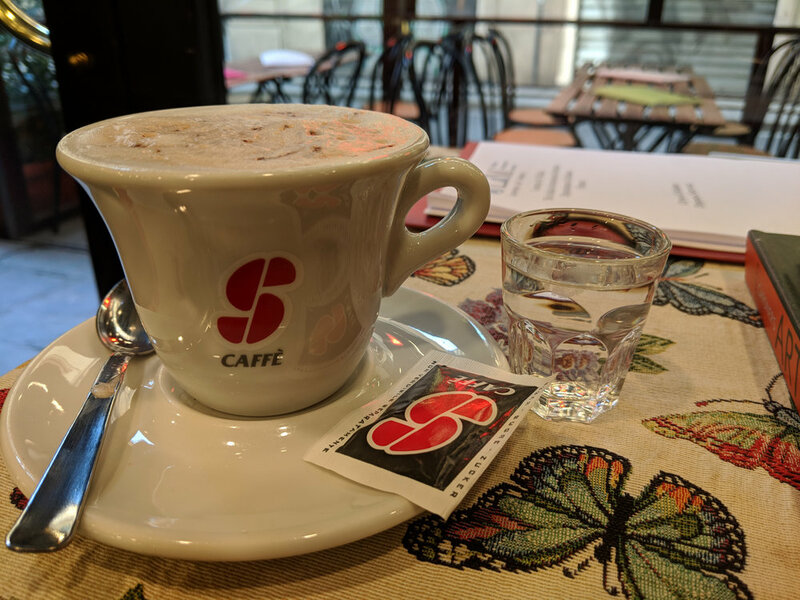 Initially, I thought well maybe Italians like their mornings with an extra kick, a shot of Vodka, but when I received my cappuccino, I was also served a shot glass of clear liquid. It turned out to be a shot glass filled with water, sparkling or still (frizzante o naturale). I did what anyone would do and threw the shot to the back of my throat and was amazingly confused. What was this weird tradition that seemed so normal to all these Italians? After further research into the subject, I found out that these shot glasses of water were provided to cleanse the palate before drinking the coffee. This is known to be an indicator of a Caffé believing their coffee was of higher quality and therefore needs a cleansing of the palate before enjoying. Not only do I love this tradition, but I felt like a local and actually believed that I was drinking superior coffee. Whether that is true or not, only time will tell. Since then, I have gone back, ordered my cappuccino at the bar and took that shot glass of water like I was an Italian myself.